The Tankerhoosen and area hiking, recreation and preservation groups will have exhibits at next weekend's Greater Vernon Holistic Healthfest. You've probably seen the signs, posters, articles and ads promoting the event. Although primarily to educate area families about natural health options, the fair has become so much more. This is the 10th fair and will have 90 tables and 40 workshops over the two days, Saturday & Sunday, April 6 & 7. Hiking, getting out to enjoy nature and other outdoor activities are all natural ways to promote good health. We are blessed to have so many trails, gardens and waterways in our area to enjoy. Town groups exhibiting include Vernon Parks & Recreation, Vernon Conservation Commission, Arts Center East, Rockville Public Library, and Strong Family Farm, as well as The Tankerhoosen. Stop by The Tankerhoosen exhibit in the Cafeteria for a free brochure - "An Outdoor Guide To The Tankerhoosen - Vernon's Green Valley". For those who would rather go shopping this weekend there are over 30 area vendors and crafts people with unique gifts you won't find at the mall. Healthfest also has its own Café with local favorite Monet's Table as well as Maharaja Indian Restaurant offering healthy fare. 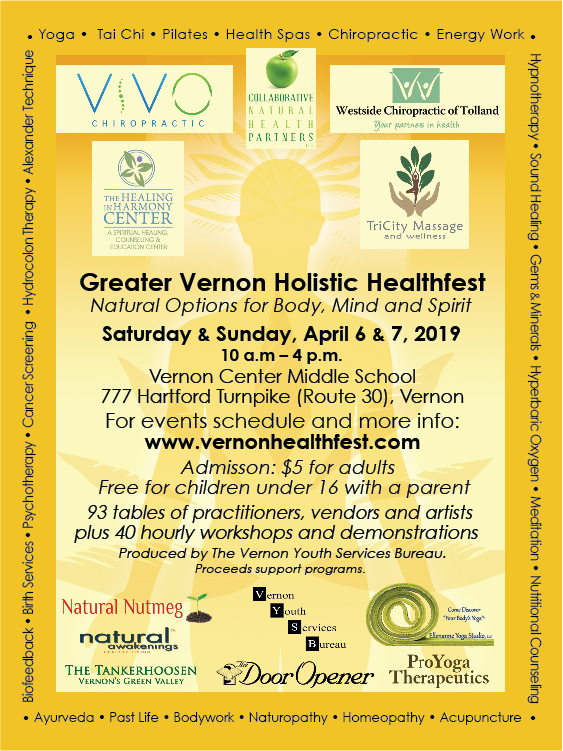 Healthfest takes place at the Vernon Center Middle School, 777 Hartford Turnpike (Route 30) in Vernon. Admission is only $5 per day and the fair is open from 10 a.m. to 4 p.m. each day. The event is a fundraiser with all proceeds going to the Vernon Youth Services Bureau to support their programs. » Go to the Vernon Healthfest website for information on exhibitors and workshops.